It’s an unpleasantly familiar sensation, much like the one we found ourselves in at this stage 2011’s Carling Cup. Surely, the lessons of that disastrous final have been learnt. We’re more experienced, more determined and more professional. We ought to do it. There are no excuses. In my opinion, the tie was effectively dead after the first leg result. If I’m honest, I’d pretty much resigned it as soon as the initial draw was made. However, 1-1 at the Allianz Arena was a creditable result that allowed us to continue our campaign with the semblance of gathering momentum. Alex Oxlade-Chamberlain was absolutely superb: in the continued absence of Aaron Ramsey and Theo Walcott, he must be one of the first names on the team-sheet. Not only did it ensure we left without suffering a dispiriting defeat, but it also felt like the moment that Lukasz Fabianski guaranteed his place in the FA Cup semi-final side. In this form, his departure on a Bosman in the summer feels like a significant loss. Their fans are as unsettled as they’ve been for some time. Speaking to Spurs supporters, it seems there’s a sense that the club lack direction and purpose. They feel little to no affinity with the players, and are worried they’re trapped in a purgatorial prison. A “negative spiral”, you might say. However, derby day is a real equaliser. We know only two well how quickly the trajectories of the two north London clubs can be reversed. Arsenal will need to ensure their focus is absolutely right if they’re to come away with three points. We need those points pretty badly. Although the increased probability of FA Cup success has made that the focus, we still have a good chance of winning the Premier League. It would take an extraordinary run, but then title wins usually do. As a man once said: it’s squeaky bum time. I’ll confess: I don’t really know what that means. Not literally. It could refer to the squeaking sound created by edging forward on your seat in excitement, or the flatulence created as a consequence of anxiety. I haven’t got a clue. I’m not sure anyone really knows. People just accepted it and laughed, because that’s what you did if you wanted to stay on Alex Ferguson’s good side. More of him later. Figuratively, I know what it means. It refers to the unique tension experienced at the business end of the season. It’s a tension all too familiar to both Arsenal, as they chase a Champions League spot, and tonight’s relegation-threatened opponents Wigan. This ought to be a hell of a game. Anything other than a win for Wigan will see the Lactics effectively relegated. Anything other than a win for Arsenal will hand Spurs the initiative in the race for the Champions League. It’s a straight-up shoot-out. If I were looking to put a bet on in a place like Unibet in this game, I’d be scouring the live betting odds for more than four goals in the game. Going gung-ho will suit Wigan, who are more comfortable in possession than under pressure. They will be buoyed by the weekend’s FA Cup Final victory over Manchester City, and with good reason: few sides in the bottom half of the Premier League could take the game to City with the ebullience and effervescence Wigan displayed. The attacking trio of McManaman, Maloney and Kone would grace teams far higher up the table. The Wembley turf is famously energy-sapping, and Arsenal will be hoping to exploit those tired legs tonight. The permutations could not be plainer: Chelsea’s win at Aston Villa has all but secured them a top four spot. If Arsenal win both their remaining games, they are guaranteed to join them. If Arsenal do relegate Wigan tonight, I’ll be sorry to see them go. Few teams in this league play football with more ambition and artistry. However, I’d far rather see Wigan go down than see Arsenal effectively relegated from the top four – especially if Tottenham were to benefit. Arsene Wenger faces several selection dilemmas. The return to fitness of Lukasz Fabianski threatens the place of Wojciech Szczesny, while the manager must also choose which of Kieran Gibbs and Nacho Monreal is best suited to cope with the trickery of Calum McManaman. In midfield, Jack Wilshere will be pushing for a recall, while Lukas Podolski’s inert performance at QPR could see his claim to the central striking role come under threat from Theo Walcott and Gervinho. Whichever side Arsene names tonight ought to be good enough to secure three points, but we’ve been here before. 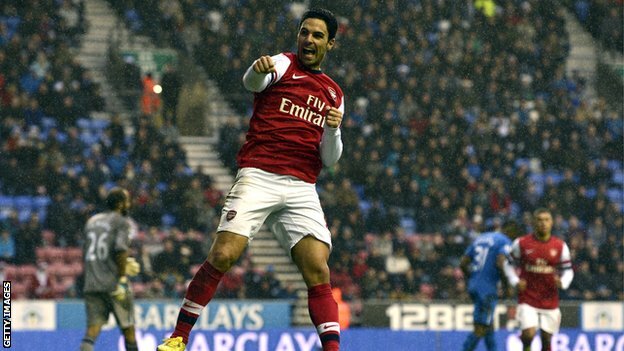 In this fixture last season, Arsenal were foiled by a tactical masterclass from Wigan. It won’t be easy. I’ll be honest: I didn’t think it would come to this. I didn’t expect Chelsea and Spurs to pick up quite so many points from the run-in as they have. Last season, it felt as if no side wanted the Champions League spots. This side, no-one wants to give them up. It would be cruel and painful to miss out so late in the day. A word on Fergie. Whatever your opinions of the man, it’s hard not to have an enormous amount of respect for what he’s achieved in the game. As I watched him bid farewell to an appreciative Old Trafford yesterday, I couldn’t help but hope that we’re eventually able to give Arsene Wenger a similarly warm send-off. Two wins this week would help make that a little more probable. Last season there was the dramatic winner against Man City, and in this campaign alone he’s proved the difference against QPR, West Brom and Wigan, collecting an invaluable nine points along the way. It’s a record that cements his status as the true leader of this Arsenal team. Thomas Vermaelen may wear the armband, but when it comes to taking responsibility on the pitch, there is no-one more commanding than Arteta. Midway through the first half there was a little moment when Sagna, stuck on the touchline and under pressure from two Wigan players, played a left-footed curling pass between the two onrushing players, across the field, and in to the path of Thomas Vermaelen. That is impressive enough. What I haven’t mentioned yet is that as he did this, Sagna was falling over. It was an incredible show of balance, strength, athleticism and technique. And, critically, something I’m not sure Carl Jenkinson will ever be able to do. Bacary Sagna is one of the best right-backs in the world. It’s essential the club do everything they can to keep him. He was our most dangerous attacking threat against Wigan, but a better reason to be playing him is that he represents a huge part of the future of this club. The other options on that right flank do not represent long-term options: Gervinho is a player whose talent seems to be on the wane; Theo Walcott still looks destined to walk away on a Bosman; and Aaron Ramsey will surely settle as a central midfielder rather than auxiliary wide-man. The Ox needs game-time to improve, and now he’s showing signs of a return to form, there’s no reason not to give it to him. …that suggest he is returning to his best. It’s clear that being dropped by Poland during EURO 2012 affected his confidence, and the injuries he was carrying in the first half of the year also undermined him. 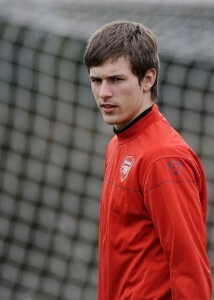 Now, after a prolonged rest, he looks a better and more mature ‘keeper. His save from Arouna Kone was the difference between this being one point and three. Yesterday’s results mean that we are now level on 30 points with Everton, Tottenham, and West Brom. Chelsea sit just one point behind, but have two games in hand. Despite their impressive form this season, I still expect the Baggies to fall away, meaning the Champions League spots will go to two from the remaining foursome. The fact we sit in third certainly puts a shinier perspective on things. Three league wins in a row gives us some semblance of momentum, and our remaining fixture of the year (Newcastle at home) looks eminently winnable. The New Year will enable us to draw a line under an uncomfortable 2012, and also hopefully under our tentative transfer policy. If Arsene’s New Year’s Resolution is to loosen the purse strings, it could make for a brighter, shinier 2013. Aaron Ramsey is out-of-form and, as it happens, out of the team. By that I mean he was only given a chance in his favoured central midfield role at Wolves in order to afford Tomas Rosicky a rest. At Everton and QPR, he was shunted in to an unfamiliar left-wing role in order to fulfil a defensive function – an unhappy square peg in an ill-fitting round hole. The only reason Ramsey came on last night was because of the unfortunate injury to Mikel Arteta. And in a fully fit squad, he would not have been first off the bench: both Abou Diaby and Jack Wilshere, entirely absent this season, would be ahead of him in the pecking order. He knows he’s not playing well. You can see it in his desperation in front of goal; his desire to make a tangible contribution to the team. The manager knows it too – he doesn’t make excuses for players who don’t need them. But there are mitigating circumstances with Ramsey. His horrific injury means that this is his first full season in the Premier League. He made his first start for Arsenal post leg-break on the 19th March 2011 – barely a year ago. This season he has been involved in no less than 40 games, starting 32. The weight of responsibility has been significant: Arsene Wenger expected to retain Samir Nasri, and have Jack Wilshere available for selection. Instead, Arsenal have leaned heavily on a 21-year old, who has only recently been able to share the burden with a rejuvenated Tomas Rosicky. In that period he himself would admit that he’s not scored enough goals, or provided enough assists. Throughout the season I’ve been quick to criticise him for being a little impetuous in his decision making, or for attempting a difficult pass when the simpler ball is a better option. However, one thing I can never question is his commitment. Despite his poor form, he’s never hid. He’s never let his head go down, or stopped trying things. He’s a player of enormous mental fortitude – he probably wouldn’t even have been able to make a top level comeback if that weren’t the case. Last night, however, sections of the crowd and huge swathes of the global fanbase couldn’t wait to get on his back as soon as he got on the pitch. His touch was admittedly uncertain, but immediately a man sat yards from me leapt to his feet and demanded he be subbed off. In the aftermath of the game, the criticism of him ranged from the illogical (“Ramsey cost us the game”) to the obscene (death threats and encouragement to take his own life sent directly to his Twitter account). Let’s deal with the facts first: Ramsey was not to blame for our defeat. By that point we were already two nil down, and whilst he was poor during his time on the pitch, he was no worse than many of his team-mates. Secondly, what do these so-called ‘supporters’ hope to gain from this behaviour? It’s hardly going to spur Ramsey on to improve. As I’ve stated many times, there’s no question over his commitment – he’s simply been asked to do too much this season, and has finally hit a rut of poor form. He will come again. There is not a team in the country who wouldn’t want the 21-year old captain of Wales in their squad. Of course, part of the fans’ collective frustration is that by this point they were already baying for ‘The Ox’. After a run of starts in January and February, Alex Oxlade-Chamberlain has recently been used almost exclusively from the bench. The fans question the wisdom of Arsene’s selection policy, but the fine form of Theo Walcott and our impressive winning run suggests its not entirely foolish. However, as soon as Arsenal found themselves two goals down yesterday, there was a collective sense that only Oxlade-Chamberlain could save us. Indeed, when he eventually did come on, after chants of ‘Ox Ox Ox’ from an impatient crowd, his arrival was met with the loudest roar of the night. I have to say, I wasn’t entirely comfortable with it. Encouragement is good – pressure to be the Messiah is not. Alex Oxlade-Chamberlain is an outstanding young player, and that has been recognised by his fellow professionals nominating him for the Young Footballer of the Year award. However, that nomination is more a recognition of his talent than his contribution this season. Look at the names alongside him – Aguero, Bale, Sturridge. They have been regular starters for their team, scoring in to the double-figures and featuring regularly at international level. Chamberlain has just five Premier League starts to his name. For all his promise, he has much to learn, and his contribution when he came on was indicative of that. He showed plenty of passion, charging at defenders and turning this way and that, but on two occasions he lost the ball and left us facing a dangerous counter-attack when a simple pass was on. He will learn, because he is good enough, and intelligent enough. But the level of expectation around this boy is becoming absurd. He is not Messi. He is not Ronaldo. I daren’t say he won’t ever reach that level – I would never set limitations on anybody’s talent – I’ve seen improvements in players that defy belief. But he’s a long way from that yet, and Arsenal fans need to show patience with his development, and measure their expectations accordingly. I would certainly have him ahead of Gervinho in the pecking order, but once Arsene had made the call to introduce the Ivorian, surely the most sensible way to use the remaining substitute was to deploy a second striker in Marouane Chamakh? I was as baffled by Arsene’s decision as I was by the fans’ jubilant reaction. It’s good to back youngsters. But here’s my worry: when Aaron Ramsey was 18 years old, I’d say his potential was roughly equivalent to Alex Oxlade-Chamberlain’s now. People were talking about him as a future Arsenal captain, a ‘Steven Gerrard figure’ and part of an exciting new generation of British talent. Ramsey is a lesson that the hype and expectation around a young starlet can quickly turn to frustration – just ask Theo Walcott, who was pilloried last night for a performance that was nullified more by Wigan’s outstanding tactics than any failings on Theo’s part. It is my firm belief that Aaron Ramsey and Alex Oxlade-Chamberlain will become massive players for Arsenal Football Club. What they both need from the fans is time, patience, support, and a bit of perspective. Let’s give them that.